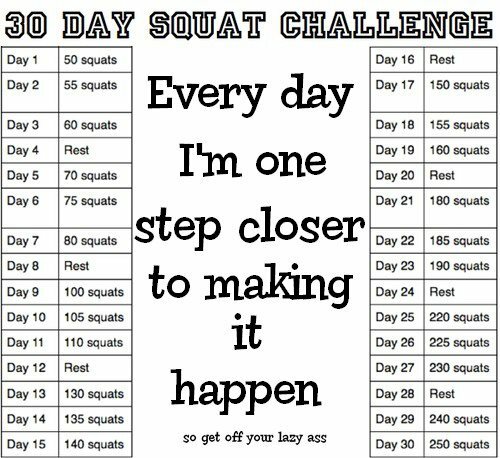 I am on Day 16 of the 30 day squat challenge. That means I have 130 squats today! I have already done 10. I have noticed a BIG difference in my body since I started doing this and changed my food intake. I know my clothing is looser. I am not weighing myself until the last day of the challnge but I already know that I have lost weight! Wow. Great job. Keep it up!!! This is awesome. I need to start exercising. These squats may be perfect since I don't need equipment and it does not take forever. Sounds like you are doing a great job. I never focus on the scale, your clothing speaks so much louder!! Keep it up. You must be proud of yourself! Keep it up!! Wow, you are rockin.. 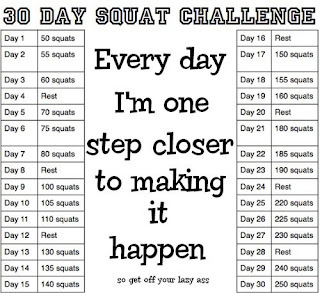 I do 50 squats but not everyday..
Great job on continuing your challenge. I would never be able to to it. Wow, cannot wait to see the total result after 30 days! Congrats, as it is working and that's good! I haven't even seen this till now I may j ust have to try this out!! Another thing for the me and kiddos to do together..